To start with, nettles provide a haven for wildlife. A safe home – or welcome cover – for many insects and smaller mammals. An important food source for the caterpillars of many of our native butterflies; the beautiful Tortoiseshell, Peacock and Comma butterflies. Less welcome are aphids, whose larva feed on their sap, rather than the leaf itself. However, this isn’t as bad as it sounds. The aphids, in turn, attract Ladybirds; whose larvae feed on the aphids – as well as many other garden pests including whitefly and red spider mite. And while we’re looking at things from this point of view, nettles can also be used to make a great liquid plant feed in exactly the same way as comfrey. In other words, soaking their chopped up leaves in a container of water for a few weeks, then adding it to a watering can as a nitrogen rich plant feed. 1 part to 10 parts of water. One word of warning, like comfrey, this “brew” can be a little pungent and is best done well away from the house! Anyway, before we digress too far, from a human point of view nettles are packed with nutrients. Vitamins B, C and K1 along with iron, calcium, magnesium, potassium and nitrogen. They’re a traditional tonic, found in many well known herbal tonics and pick me up’s such as the ever popular Floradix iron tonic. They are also a natural diuretic, helping to gently encourage the removal of excess water from the body. At the same time, they provide good levels of potassium and magnesium, which can be easily lost with many other less natural diuretics. For these reasons nettles were traditionally used to help with Kidney and Prostate problems, water retention and urinary infections. A less well known aspect of nettles is that they are anti inflammatory. They can be used to reduce the inflammation associated with Arthritis as well as other aches and pains. Interestingly, this is borne out by Elaine’s Grandmother, who used to look forward to the first nettles of the season and then go and pick as many as she could find, until her hands were covered in their stings. Not only did the Arthritis in her hands improve as a result but she always said that she never felt any discomfort from the stings. Of course this isn’t something we’d suggest you do yourself, there are much easier ways to get the same benefits from them! 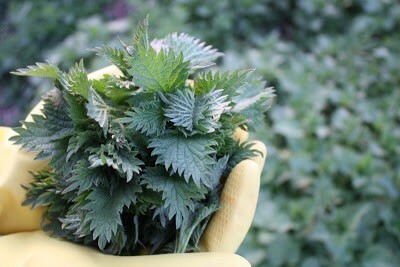 Nettle poultices were also used to soothe burns as well to with allergies, Eczema, Asthma and Hayfever. With all these benefits, the question is how to safely – and painlessly (!) - get them. Well, the easiest way is using dried nettle tea bags, where all the work has been done for you. Alternatively, similar benefits can be found from nettle tincture. However, one word of warning. Being a diuretic, nettle tea, is best drunk early in the day unless you want to risk a disturbed night with trips to the loo! For the more adventurous, it’s simply a case of putting on some sturdy gloves and going foraging – away from roads and not too close to public footpaths or other places any unwelcome “donations” may be left. Just pinch out the tips, as this is the most tender part and highest in nutrients. When you get home, rinse them under the tap before steaming for a few minutes in exactly the same way as you cook spinach. Alternatively, they can be wilted in a frying pan with a little olive oil – and garlic for a bit of added oomph. Finally, nettles can be made into soup, using vegetable stock and potato to thicken it. To make fresh nettle tea, simply add a – gloved (!) – hand full to a teapot, pour over boiled water and allow to brew for a few minutes. It can then be drunk hot or cold as a tisane. It can help to give you an energy boost but without the caffeine associated with tea or coffee. As always, there are a few things to remember about nettles. Their diuretic effect means that they can interact with blood thinking drugs and those for high blood pressure. They can also interact with drugs for Diabetes. So, please, bear this in mind if you’re taking any of these medications. It is also not recommended during pregnancy as it can occasionally trigger contractions. So have we tempted you to do make the most of this very early spring and do a little foraging – or letting a patch of nettles grow in the corner of your garden?